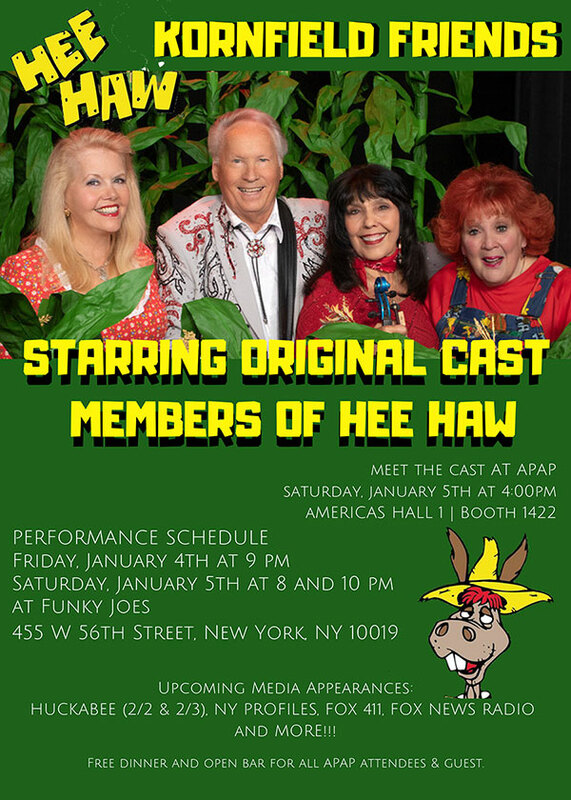 Hee Haw Celebrates 50th Anniversary As Kornfield Friends Set To Perform In New York City At APAP Convention | 2911 Enterprises, Inc.
New York, N.Y. – Four original cast members (Lulu Roman, Misty Rowe, Jana Jae and Buck Trent) of the hit country music variety show HEE HAW are hitting the road in 2019 as the Kornfield Friends! Kornfield Friends will bring a touch of ‘Kornfield Kounty’ to stages around the US and Canada and will have the audience involved from the beginning to the end. Whether singing, clapping, laughing or crying, this show has something for everyone. In celebration of HEE HAW’s 50th Anniversary, the foursome will be making the rounds in New York and Nashville not only to celebrate the history of the comedic television property, but to all talk about their upcoming tour stops as the Kornfield Friends. Appearance will include a sketch on TBN’s Huckabee, Fox News Channel, NY Profiles, RFD-TV, Do You Remember, SiriusXM, and much more! LULU ROMAN served up many laughs and, well, some greasy food at Lulu’s Truck Stop where the food and customer service was usually pretty bad. In addition, Lulu is remembered for being a member of the Hee Haw All-Jug Band and her sitting around on an old-fashioned sofa in the parlor being a deadpan character and commenting. MISTY ROWE is known for her “Bedtime Stories” sketch. Rowe would deliver one of her bizarre stories, sometimes a rewritten nursery rhyme. By the sketch’s end, she would deliver a humorous “moral to the story,” giggle, wink at the camera, and blow out the candle which was lit on the nightstand next to the bed where the story was told. JANA JAE, known for her virtuosity on the ‘Magic Blue Fiddle,’ is planning on taking the Hee Haw audience on a musical journey where she performed on the historic television program either as part of the Buck Owens band or as a soloist. BUCK TRENT is known for his pickin’ and grinnin’ as a featured performer on Hee Haw as well as his years working with Roy Clark. Kornfield Friends is executive produced by Jana Jae and booked by Robert Williams and Whitney Crabtree for WBA Entertainment.